This year when Mary and I were considering a backpacking trip to the Sierras, we saw that a lot of trails in the National Parks were already out of permits. Since we rarely get anywhere early enough to get one of the walk-in permits, we decided to check other locations. 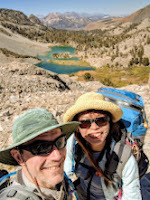 After all, we really enjoyed our trip in the Desolation Wilderness last year. One of our primary interests is looking for pikas. 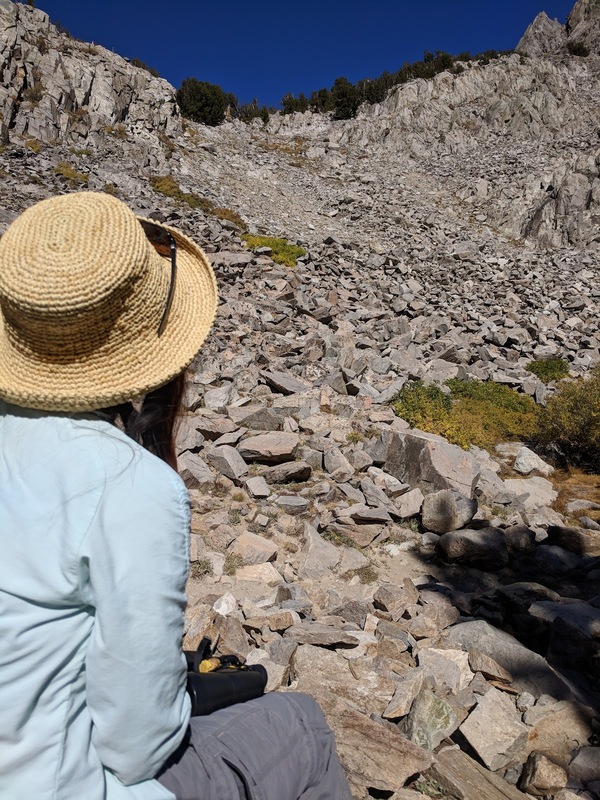 The logical thing to do was to check iNaturalist for pika sightings and head to a location with a few recent observations. 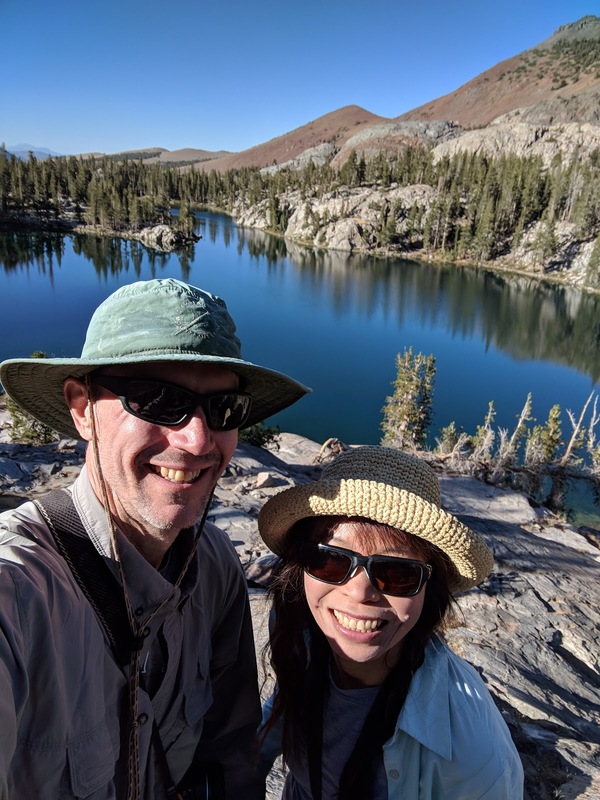 We found a few possibilities, and settled on the aptly named Pika Lake in the Inyo National Forest and John Muir Wilderness near Mammoth Mountain in the Eastern Sierras. 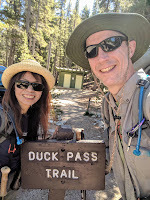 We managed to reserve a 2 night permit for the Duck Pass-JM01 trailhead from Recreation.gov. Next we had to get our gear ready. 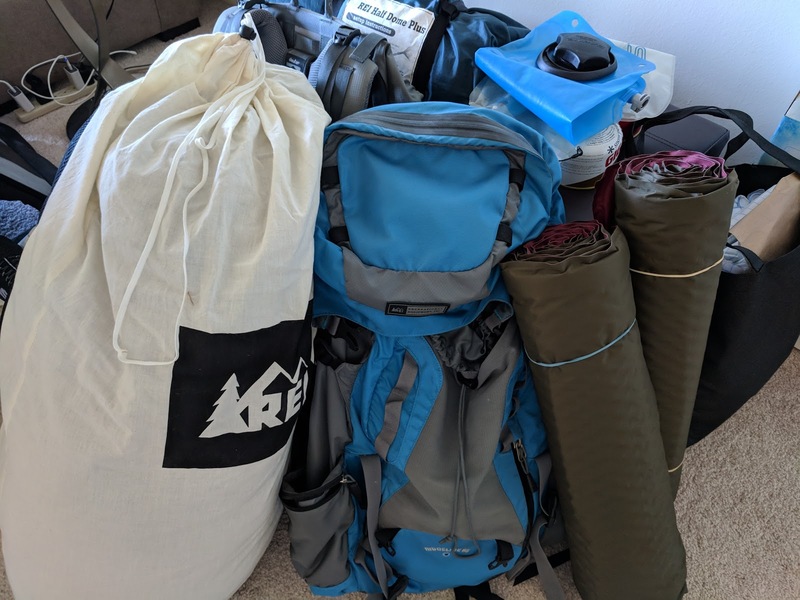 We would be backpacking for 3 days/2 nights then a night at a hotel so we could hit a day hike in Yosemite on the way home. The days would be sunny and in the mid-60s, which is beautiful hiking weather. The nights were likely to be closer to 30 and possibly windy. 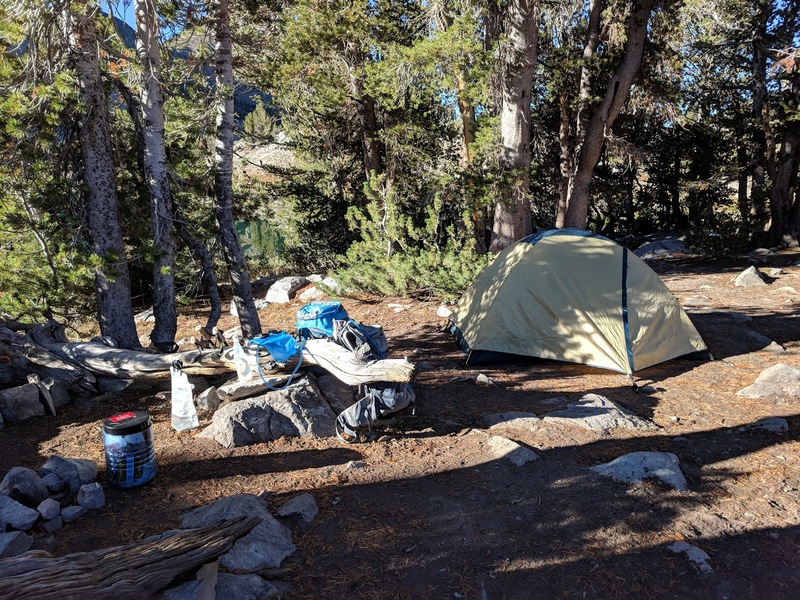 We both have pretty good sleeping bags and we packed a couple extra layers and hats and gloves. 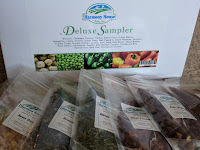 Rather than buying pre-made dehydrated meals, Mary decided to make some. 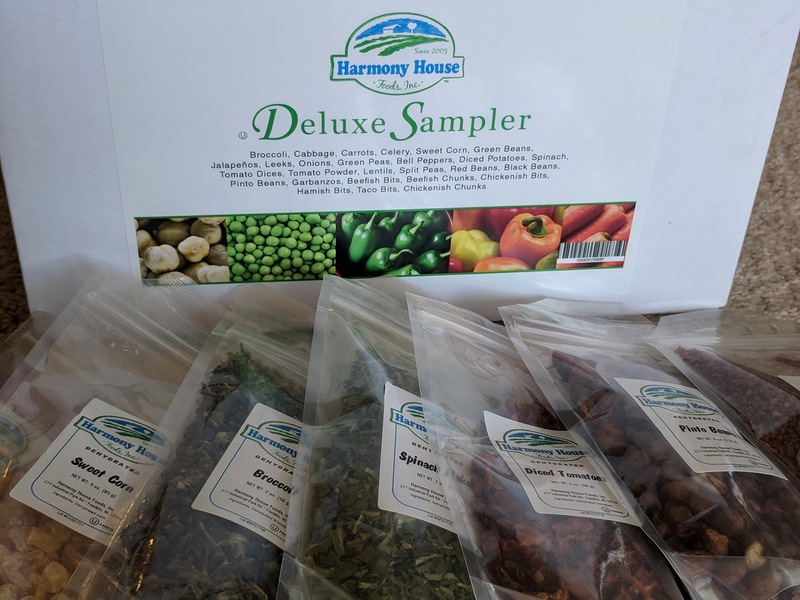 We had bought a box of dehydrated ingredients, the Harmony House Deluxe Sampler, to have for emergencies and for backpacking. It contains 32 different vegetables, beans and vegan proteins. Following some recipes from the internet, she put together meals for 2 nights, one Mexican and one Thai. We put them in ziplock bags that could withstand boiling water. We also made some makeshift cozies out of packing foam to insulate the meals while rehydrating and making them a little easier to eat. We hit the road at 6am. Traffic was light in our direction, so we made good time getting out of the Bay Area. Shortly after Oakdale, we decided to take 108 instead of 120. 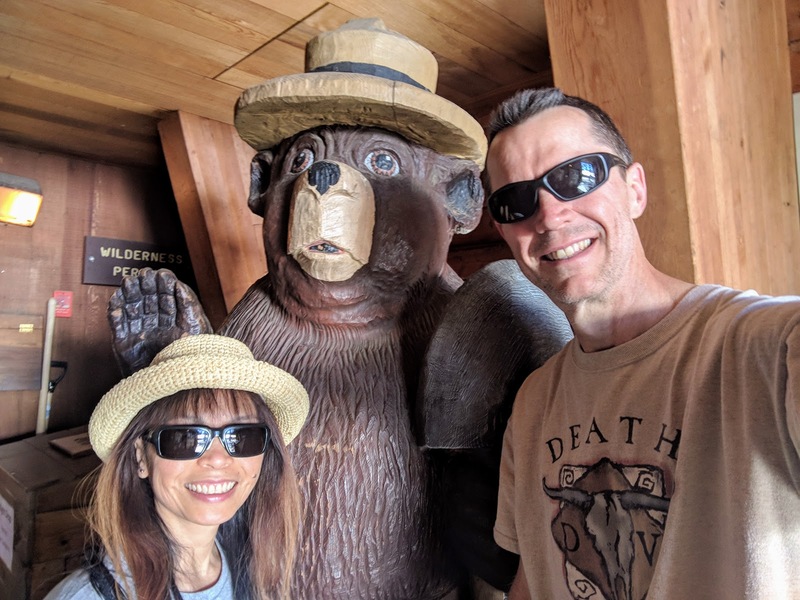 We had never been across 108 and we wouldn't have to pass through the gates of Yosemite. The route was a little longer, but not so much, although we did hit some construction delays coming south on 395. 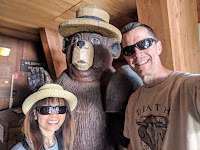 We arrived at the Mammoth Lakes Welcome Center to pick up our permit at 12:15pm. You are supposed to pick up permits no later than 10am on the day. I had not requested a late pickup, but luckily the rangers were able to reissue our permit. After a restroom break and a photo with a local celebrity (see photo on right), we headed for the trailhead. 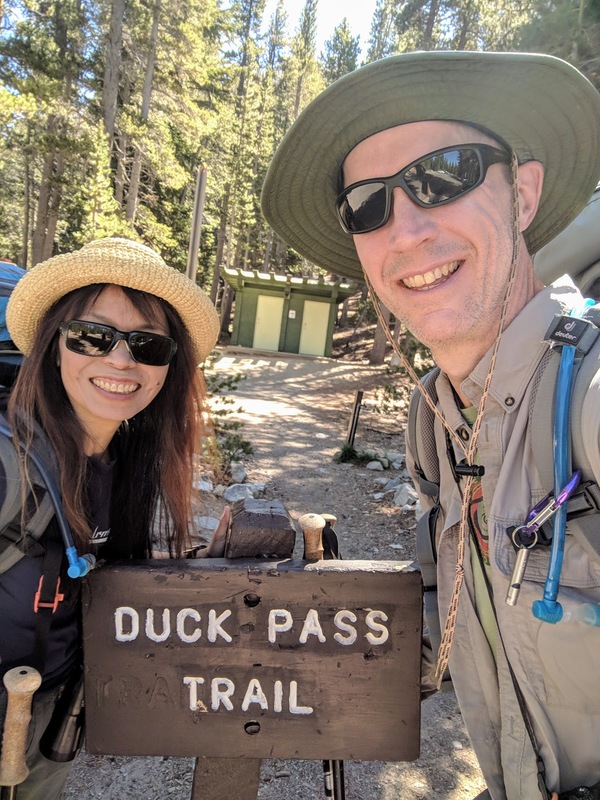 We got to the Duck Pass trailhead at 1:30pm. The trail starts at 9126 feet and climbs a little over 500 feet in the first mile. Having just left sea level that morning, the altitude was getting the better of both of us. We get in cardio most days, but we haven't been doing much hiking lately, so our legs weren't used to this workout either. Not to mention we don't usually have big packs on our backs (Mary's was 20 pounds and mine was 35). All in all, we struggled a bit. It took us nearly 50 minutes to do that first mile or so. 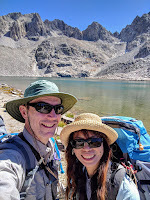 We were happy to take a break when we reached Arrowhead Lake (pictured on right). We dropped our packs, ate a little lunch and rested for a bit. In the next 0.7 mile we only climbed about 200 feet. 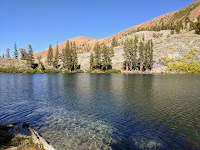 We had arrived at Skelton Lake (pictured below). From Skelton Lake it is fairly level to Barney Lake at around 2.6 miles and 10180 feet. 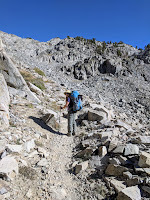 A little ways after Barney Lake is a slog up a set of switchbacks through a talus field (pictured on left). This was the main area we hoped to encounter pika, so we took our time passing through. At a few points we could hear the pikas' barking in the distance (eep eep! ), but we did not sight any. The view from the top of the switchbacks is quite lovely (pictured on right). 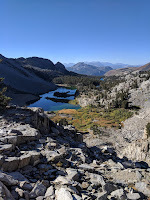 You can see Barney Lake immediately below, Skelton Lake further in the distance and Mammoth Mountain at the end of the valley. We were still hearing pika in the distance, but still no sightings. From the top of the switchbacks, it's a short distance to the junction for Pika Lake. The view from here is dominated by Duck Lake. 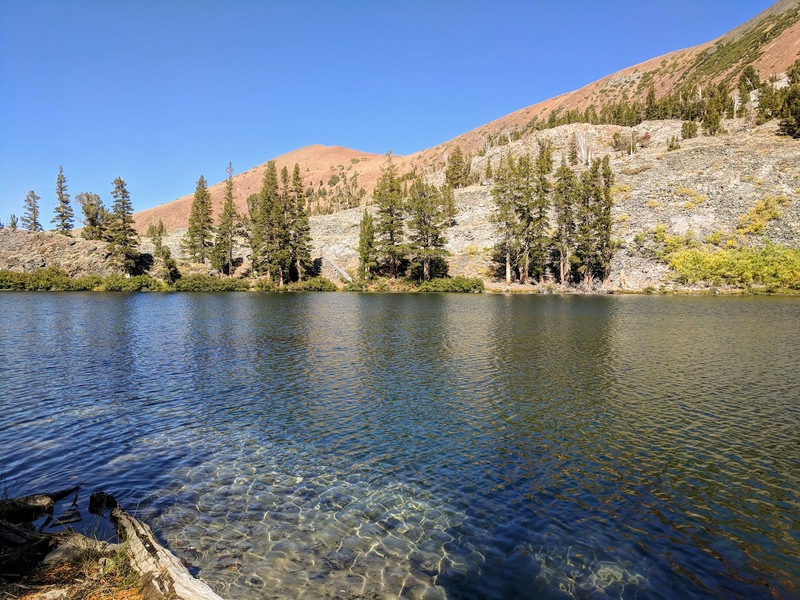 The trail drops 200-300 feet toward Duck Lake and wraps around the northeast end of the lake. After a mile or so we reached Pika Lake. We explored the north side of the lake and found we had our pick of camp sights. It seemed we would have the lake to ourselves for the night! 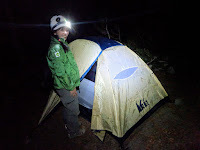 It was almost 6pm, so we filtered some water, set up camp and made some dinner. We ended up having the Mexican meal for dinner. It was pretty tasty and the cozies worked pretty well (pictured on left). It was nice having separate containers. We usually split on back of the store bought meals. It was a little after 7pm. The sun was down, but there was still a little light in the sky. The temperature was dropping fast, so we finished setting up the tent, stowed all the food and scented items in our BearVault and settled into the tent. Inside the tent we set up our Therm-a-Rest sleeping pads, sleeping bags and some new inflatable pillows we bought for this trip. By 9pm we were settled in the for night. We did indeed have the lake to ourselves. Other than a few eerie coyote howls in the distance it was very peaceful. In spite of the peace and quiet and extra comfort, neither of us slept very well. It was still pretty cold in the morning. In fact, our Platypus water container had ice in it. We lingered in our sleeping bags until about 7am. Pika Lake was like glass (photo on left). This morning we headed to the east end of the lake to explore some talus there in hopes of finding pika. We didn't hear or see any. We headed back to camp for breakfast where we were greeted by one of the locals (see photo on right). Breakfast consisted of an oatmeal mix we made, stored and served in a similar way to dinner the night before. We had steaming cups of hot chocolate to help warm us as we waited for the sun to take the chill from the air. The squirrel really wanted to join us for breakfast, but we kept shooing it away. It had the last laugh as I left my pack unattended, and it helped itself to some trail mix in the side pocket. We left our camp set up at Pika Lake. 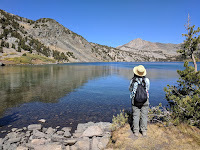 Today we were going for a day hike along Duck Lake and down to the Pacific Crest Trail. Mary had brought a small daypack, but I had to clear out my Deuter pack and carry it. We hiked our way back around Duck Lake (pictured above) and up to the Duck Pass Trail. There was a bit more of a climb as we hiked along the west side of Duck Lake. From the trail summit we could see Pika Lake across Duck Lake (see photo on right). Duck Lake is pretty big. It's more than a 1/2 mile along the west side. 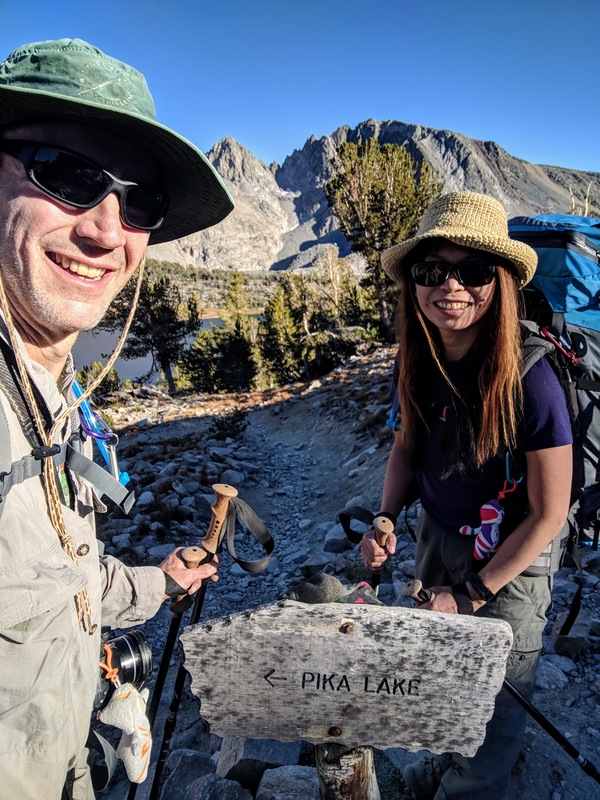 After crossing the outlet for Duck Lake, the trail starts to descend towards the Pacific Crest Trail (PCT). Before it descended much, we had some great views of the valley beyond (see photo on left). We headed down the trail for about a mile. 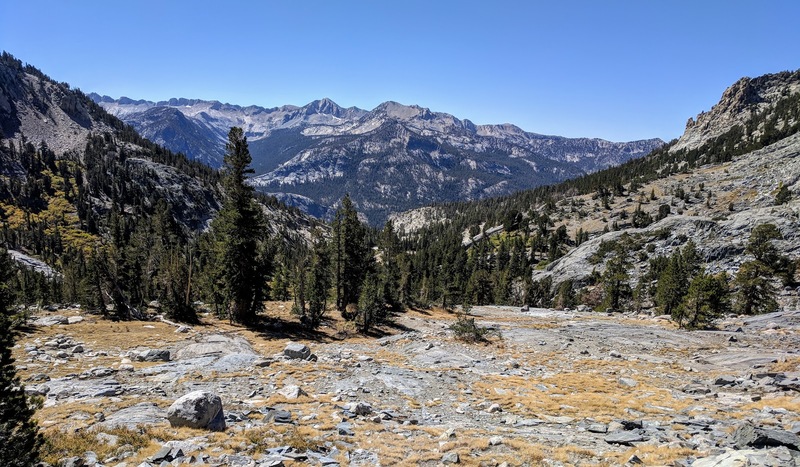 We reached the PCT around 12:40pm (photo on right). 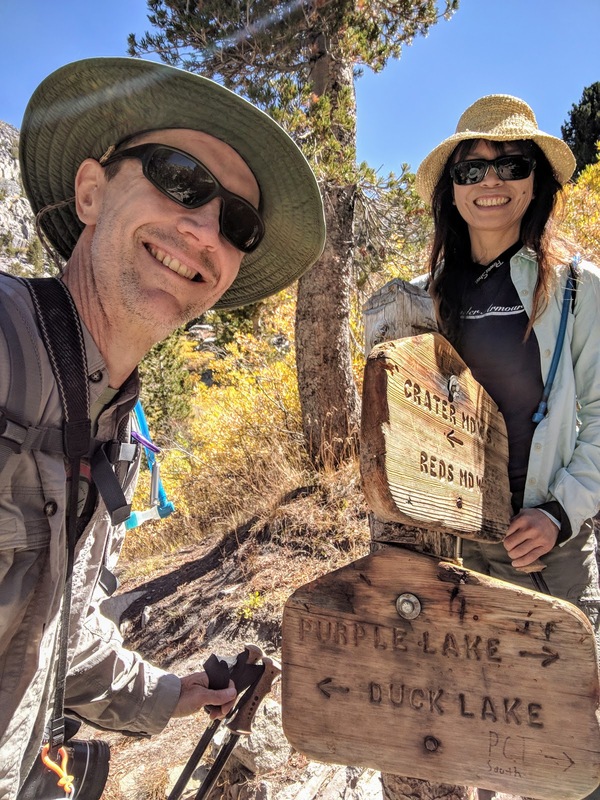 We thought about continuing on to Purple Lake a couple miles further, but decided to head back instead. We still had hopes of finding pikas at Pika Lake. 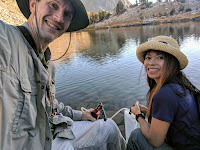 We got back to Duck Lake a little after 1pm and stopped there for lunch. 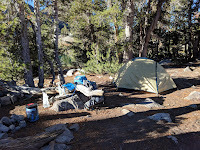 There were a couple of other people there, planning to camp for the night. We ate lunch and got back on the trail. We covered the same ground across Duck Pass then down the Pika Lake Trail to the other side of Duck Lake. We got back to Pika Lake around 3:20pm. This time we headed to the southwest shore where we had seen another promising talus field (pictured right). We spent a good hour or two there. We did hear and see pika at this location, but only fleeting glimpses. While we were watching for pikas, we saw a group of guys arrive at Pika Lake. Fortunately they set up camp to the west of the lake, far enough away from our site. Eventually we gave up on getting a photo of the elusive pikas and headed back to our own camp. As the sun was setting the moon was rising. We could see the moon above the peak at the east end of the lake. The setting sun giving the peak a nice alpenglow. While we were preparing dinner a little mouse paid us a visit. It was pretty cute, but we didn't want it anywhere near our food. We had the Thai meals for dinner this night, followed by some hot chocolate. After dinner we settled into our tent. We managed to sleep a bit better this second night. This morning was our last chance to photograph pikas at Pika Lake. We decide to give the talus area on the southwest shore another try. We grabbed a couple of energy bars and headed there before breakfast (see photo above). Once again we heard them and saw some in the distance, but managed no photographic evidence. During breakfast, we were visited once again by our squirrel friend. It was still very cute, but we did not share any of our food with it, not even the trail mix! We ate our oatmeal and hot chocolate and started the break camp. We had spent quite a while looking for pikas in the morning. 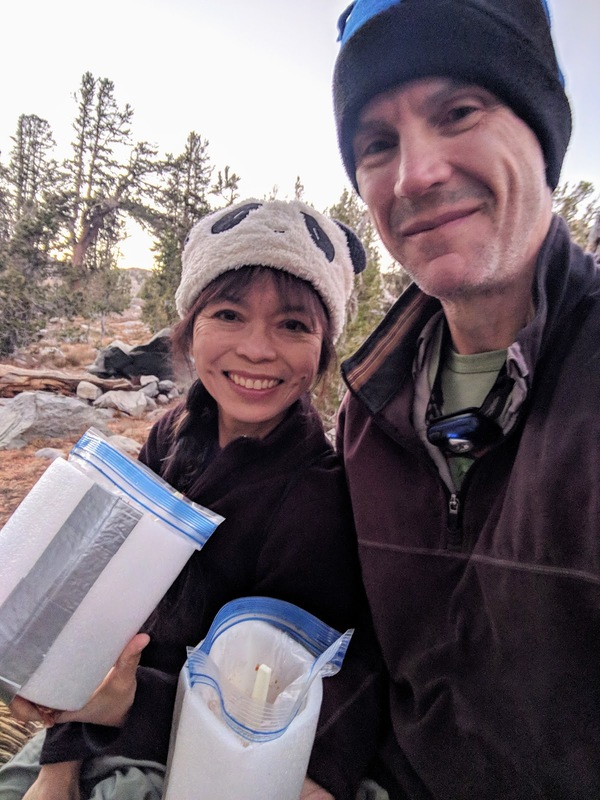 Then there was breakfast, filtering water and packing up. 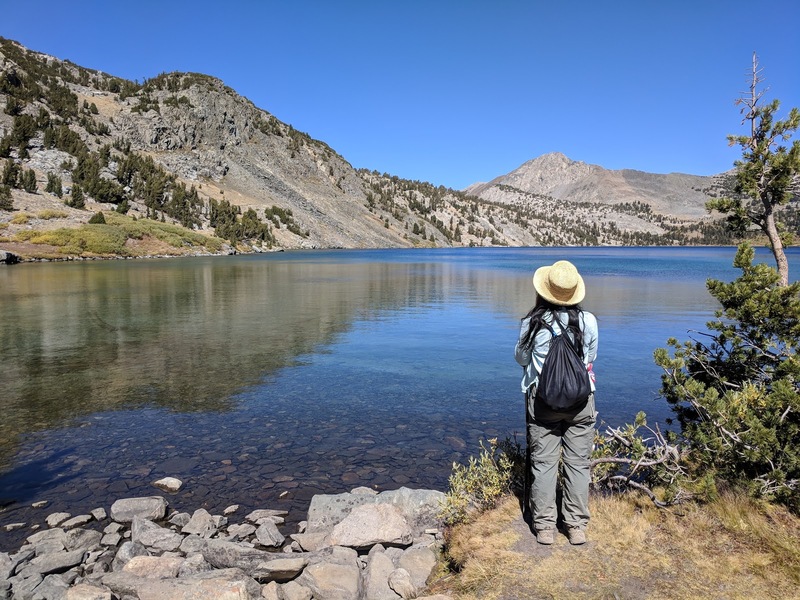 By the time we were ready to say goodbye to Pika Lake (photo on left), it was after noon. 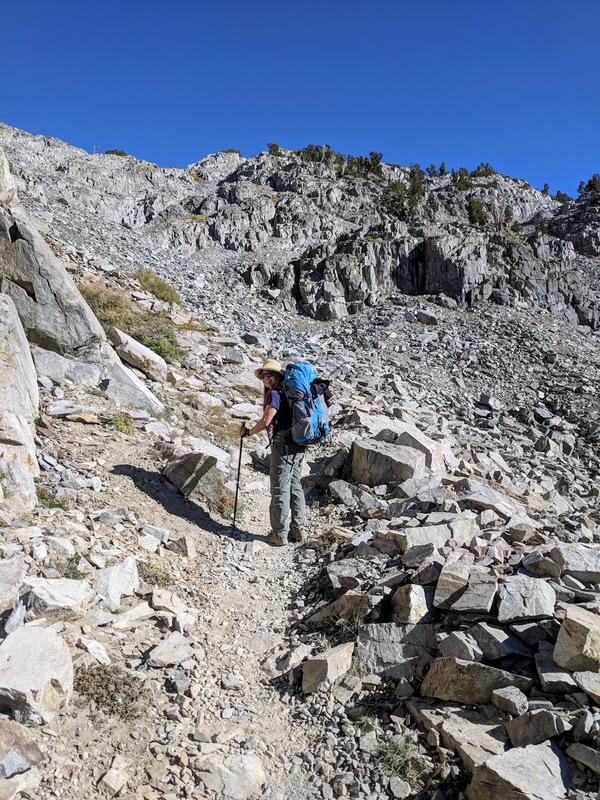 Climbing back up to the Duck Pass Trail was a little harder today with our full packs. Fortunately most of the rest of the hike would be down hill. On our way down the switchbacks we stopped numerous times to look for pikas. We occasionally heard them, but did not see them. Near the bottom of the switchbacks we found a nice rock to sit and rest. Shortly after we dropped our packs, we hear the "eep eep!" call of a pika. We sat patiently and waited. We were finally rewarded when a pika showed up to pose, eat and scurry around the rocks! We were happy to finally get some shots of pikas. We were still smiling when we stopped for a snack at Skelton Lake. It was Friday, and we were seeing a lot more people on the trail. We even saw a few hunters, which was a bit odd for us since we're used to hiking in National Parks. 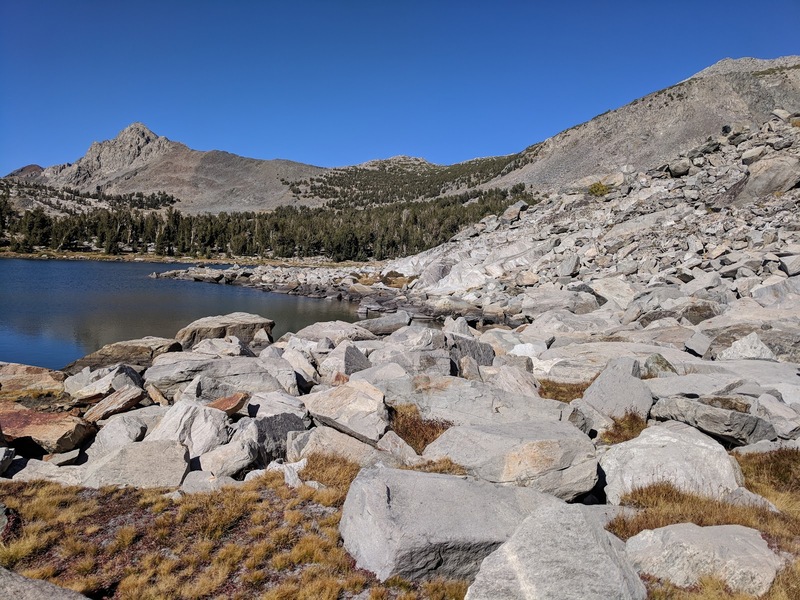 Between Skelton Lake and Arrowhead Lake, we took a different trail back to the parking lot. This trail passed Emerald Lake and seemed to be less traveled. Emerald Lake (pictured below) is a deep green color as the name suggests. It was nearly 5:30pm by this point, so we continued on. We only passed one hiker and her dog on the Emerald Lake Trail. We arrived back at the car around 6pm. 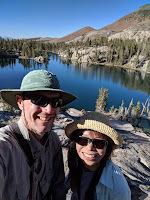 We drove into Mammoth Lakes and checked into a Travelodge for the night. We quickly showered and went out for a nice dinner. It was nice to spend the night in a bed (although not nearly as comfortable as the one at home). While we didn't see as many pikas as we hoped, we did get one great visit on the last day. The high Sierra scenery was absolutely beautiful. We struggled with the hikes more than we would have liked, but fortunately we hadn't signed up for more than we could accomplish. 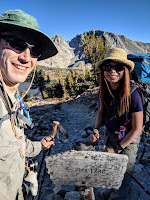 All in all, we had a great time on this backpacking trip. For more photos from the trip, check out the album.